Day 6: May 3, 2015. Today we are on the Greek island of Kos, also spelled Cos. The island is famous for its Asclepion, a place of healing dedicated to the god Asclepius and as the birthplace of Hippocrates, the father of modern medicine. 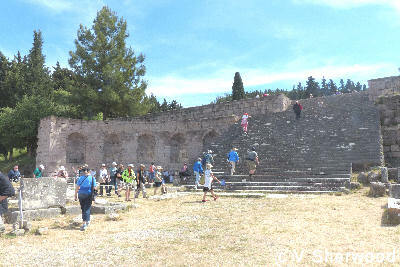 First we took a bus to the Asclepion which is 3.6 km from Kos town where our ship was anchored. 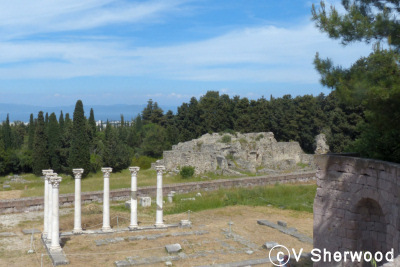 The Asclepion is a centre of healing dedicated to the god Asclepios, where Hippocrates practiced medicine almost 2500 years ago, . From the Asclepion, our bus took us back to Kos Town. We were dropped at the Roman Odeon and walked through the town to the Western Archaeological Site (gymnasium and baths) to the main square of the town with the Archaeological Museum, mosque and covered market. 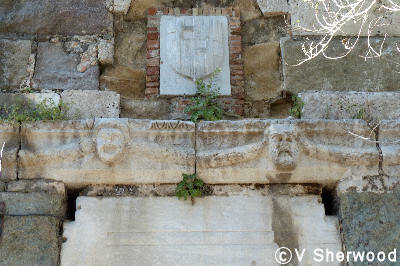 From there we walked past the ruins of the Agora to Hippocrates Tree and the bridge to the Knights' Castle. Kos was first Greek, then Roman. 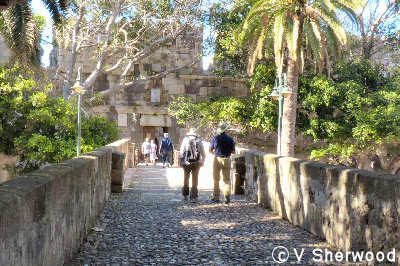 In 1332 it was taken over by the Knights of St. John (Knights Hospitaler) from Rhodes, who fortified the town. In 1523, the island was taken over by the Ottomans who held it for 400 years. In 1912, the island was ceded to Italy after the Italo-Turkish War. There was a major earthquake on April 23, 1933, which demolished Kos Town. 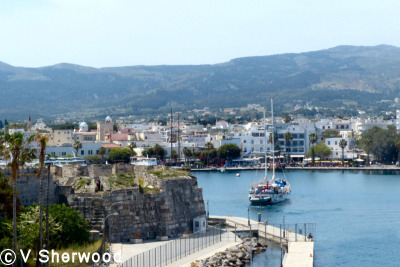 After World War 2, the island became a protectorate of Great Britain which ceded it to Greece in 1947. This is a map of the Asclepion on Kos. 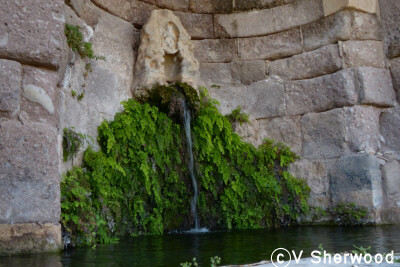 It is located about 4 km outside Kos Town, on a low hill where there are several springs. The sanctuary was built on 3 levels. The lowest level contained a propylon (entrance), baths, rooms for patients, toilets, a stoa and other buildings. The second level had a massive retaining wall with a huge staircase. At least 2 springs fed fountains. 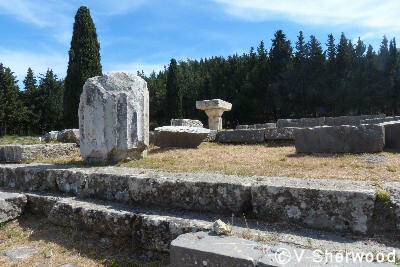 There were several temples, including a Corinthian temple (dedicated to Apollo? ), 7 columns of which have been restored. At the top of the stairs leading to the third level was the Doric temple of Asclepius. 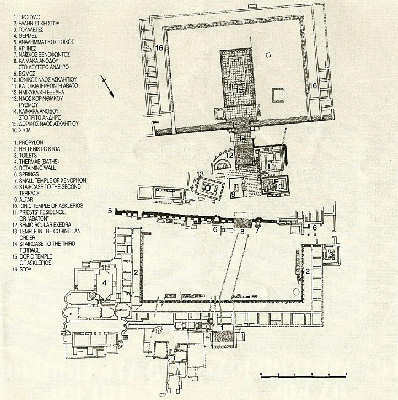 The precinct was surrounded by a stoa. The second level was supported by a huge retaining wall. A magnificent stairway led up to the second level.. This is one of several springs at the Asclepion. The springs are probably the reason why a centre of healing was built on the site. Looking down from the thrid level to the Temple of Apollo on the second level and the baths on the first level. 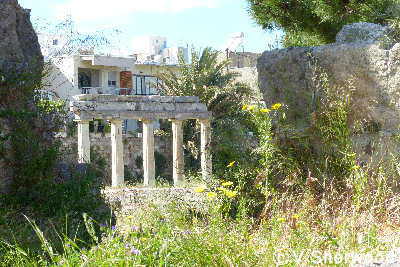 The Temple of Asclepios on the third level. Kos harbour. 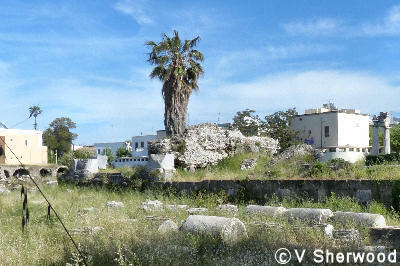 In the left foreground is the ruined castlel of the Knights of Rhodes, who later became the Knights of St. John of Malta. 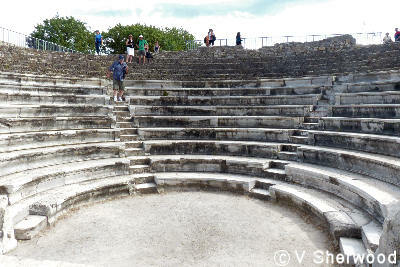 The Roman Odeon, a roofed theatre and concert hall. The ruins of the Gymnasium Baths. Five of the seventeen restored columns of the Gymnasium roof. There were originally 81 columns. The Agora. 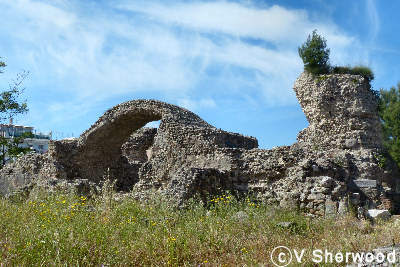 The castle of the Knights of St.John from Rhodes was built on part of the agora. Many of its stones were used to build the castle. Greek stones in the wall of the Knights' Castle. The bridge and gate into the castle. Hippocrates' plane tree. 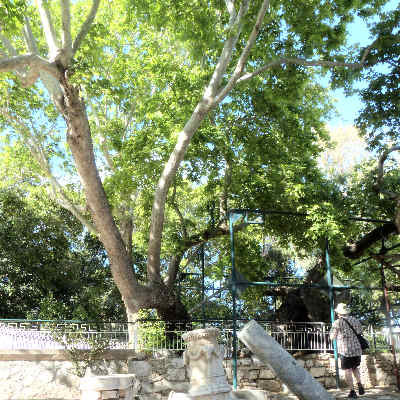 The physician Hippocrates was said to have sat and taught under this tree. Since Hippocrates was born in 460 BC, it was certainly not this tree but perhaps an ancestor. Kos was taken over by the Ottomans in 1523. The mosque of Gazi Hassan Pasha was built in 1786. 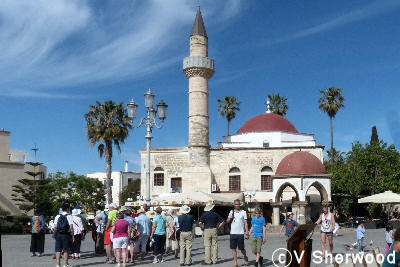 Kos remained under Ottoman rule until 1912, when it was taken over by the Italians after the Italian-Ottoman War. A very severe eathquake in 1933 devastated the Town of Kos. It was then revealed that the town was built on the foundations of the Greco-Roman city. The archaeological sites were excavated and the town rebuilt by Italian architects. 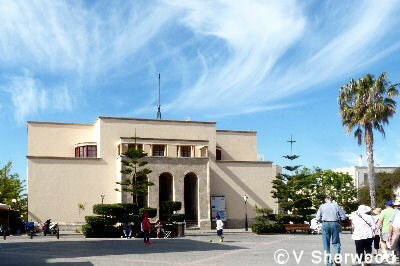 The Archaeological Museum is an example. 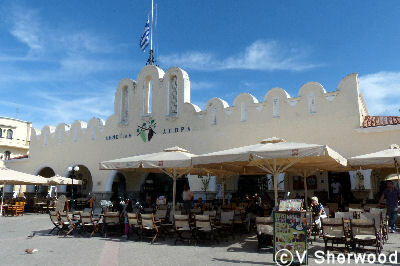 The market on Eleftheria Square, opposite the Archaeological Museum, is also built in the Italian style of the 1930s.